Love these little shortbread cookie nuggets! Pop one in your mouth and it just melts. You cannot stop at one,I know, I've tried. I've been making them for a number of years for Christmas and they never disappoint. 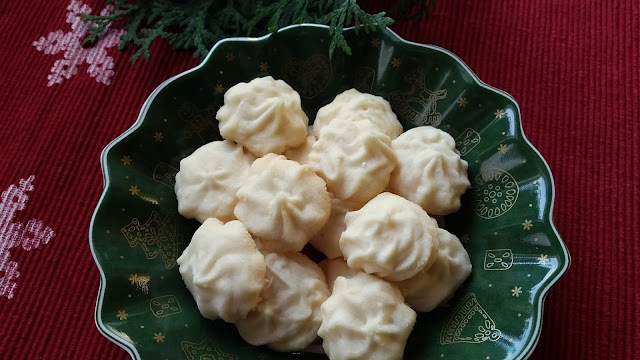 Whip butter and icing sugar together until creamy. Slowly add in flour, then turn your mixer to the whip setting. Whip mixture for 6 to 7 minutes scraping sides occasionally. Longer length of whipping time results in lighter shortbread. Use a cookie press if you have one, or you can use a small cookie scoop or teaspoon and place cookie dough on parchment lined pans. You may decorate with sprinkles, coconut, or pieces of cherries. I prefer to leave them plain. Bake in a 275º oven for 30 minutes. Hi Betty, do you use salted or unsalted butter? Thanks! Janina, I use salted butter. This is exactly what I've been looking for to make for this weekend. Thanks! I guess these are next on my baking list later today. Thank you. How many does it make? These sound amazing and simple. We have a lactose intolerant member of our family. Have you tried to make these with margarine? Do you melt the butter first or just soften it? I have a potluck tomorrow and I think I'm going to try these. I love shortbread. I just soften the butter enough so that it whips nicely. Don't melt it. Yes you can use a hand held mixer. I made today, but used the smallest cookie scoop I had so my yield was lower. I folded in two handfuls of holiday parells into the batter. They are lovely. I might have had more yield, but my husband kept snitching the batter since there were no eggs in it. Hahahaha! why no vanilla or almond extract? You could use a bit of flavoring if you wish but we like these plain. Oh really? I have had the cookie press sitting on the counter all day. Sounds easy enough! I am going to bake these tonight. That's the same recipe I use from years ago...and what a pretty bowl!! I dont have the whip setting? Would it just be highest speed then? I'm sure you could but it would change the flavor somewhat. could you add salt if using unsalted butter and if so, how much would you recommend? I would guess you could add 1/4 teaspoon salt. How did you get them to look like that though? I mean, it looks like you used an icing bag and tip! That's what you could use. I tried these and they turned out great! Thank you so much for sharing. This looks easy enough. I might give them a try, too. Have a blessed weekend and a very Merry Christmas! I'm sorry I can't answer that as I have not substituted any of these ingredients. If you try please let us know the results. Is icing sugar the same as powdered sugar?